I think if we knew everything Blackwater did our heads would spin off our shoulders.somethings are better left unsaid. There were 2 guys that were good friends in my school as a kid. One went to the military, the other became a cop. War is a failure of diplomacy and leadership. People in the ranks take after their leaders. and is a shame upon us as a people. and needed an outlet that was legal. Well put, Jose. Thank you. I like your theory. It explains why Arabs have been flocking to Iraq, Afghanistan, and all the other countries in conflict. They have the opportunity to commit violence against not only American soldiers, but they kill innocent civilians by the tens of thousands. I guess you're right.... violent people seek out violence. And once again!!! you're right.. their spiritual leaders are the ones who convinced them to do it. We both know that Arabs will not go against their spiritual leaders and what he "says" the Korhaan says.. You have proved your own point. That the many Arab leaders both religious and political are total failures without any ethical compass. At least your two friends who were bullies (assuming they were in the US) might have to answer for their crimes in Civil or Criminal court. Jihadists never answer for their crimes against humanity.... They are praised for it by SOME (and I did emphasize SOME) of the Islamic world. Just watch a video of them killing innocent people.. they are praising Allah the entire time!! "Allah Akbar" over and over again. Sound like a damn turkey gobbling during mating season!! So I guess the Arabs out their committing these violent acts against innocent civilians should bring shame to all the Middle East according to your way of though. But we both know.. they already do!! What about Fast and Furious? Holder will chase these guys but not come clean himself. acaDEMI? Seriously?? did she just screw up that name bad or what? Ok tards who know nothing.... but claim to because you read something rather than put your boots on the ground!!! When BW left, a new company hired many of the SAME guys for the SAME job... no incidents since then!!! We go outside the wire every day without any further incidents. That should make a person with half a brain wonder if maybe... just maybe the team was returning fire rather than going around murdering innocent people. ALL of us come from the military or law enforcement. Not the little babies who claim PTSD because they heard an explosion half a mile away like so many who cowered their way back home trying to collect a check. The guys who work here are the best of the best. Rangers, SEALS, SF, MARSOC, SWAT, PJs, and traditional soldiers who excelled. We all go through through background checks.... more so than your local cops... more than the traditional military troops... we maintain higher physical fitness standards, higher shooting standards, more frequent drug testing, better driver training, and over all better training. Well said, however, the idiot go to college and stay home and have no clue what you're saying. 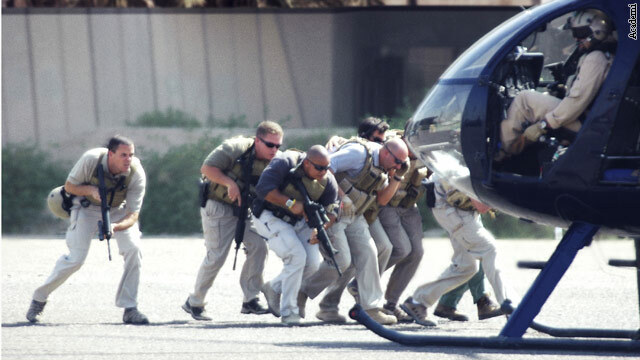 I know many of the blackwater personnel they are good people. While in Iraq the only security people we trusted were blackwater and the brit many who were former SAS. I served twenty-one year in Airborne Infantry and SF units, one thing I know most American people have no clue what are service member go through. Good post, bobpitt. How true that is, but unfortunately, there are are a lot of ignoramuses here and across the country who'll take up for these clowns no matter how many people they murdered!!! Well said, john. I was about to post the same thing here. As you said, these ignorant people who take up for these murdering bozos need to keep their ignorance to themselves and quit disgracing this country by revealing their presence in it! John, it seems your intolerance and lack of understanding far exceeds mine. I’m guessing by your writing English isn’t your primary language. So I’ll compliment you on replying in a foreign language. I should probably say Eid Mubarak, even though it might be a bit belated. Your attempt to insult me by calling me a grunt is a bit sad actually. Yes, I have chosen to protect my community, my country, our allies, and our way of life. I don’t expect everyone to be able to serve and protect in the way I do… I don’t even expect everyone to support those of us that do. That is the beauty of the US, you can burn our flag and still sleep safely in the home you chose to purchased without fear of the government coming after you. After 23 years in the military and 15 years of being a police officer I’ve lost count of the number of people just like you who I have risked my life to protect regardless of your feelings about me or my job. I would never expect someone like you to do the same for me though. It’s not in your nature to protect those you don’t agree with… your intolerance guides your life and places yourself above everyone else. Don’t be embarrassed, you’re just being the person you have chosen to be. Will justice be done here or will these politically "correct" goons buy their way out of this one as usual? These guys seem to almost always literally get away with murder while good guys like Pfc. Bradford Manning get the shaft! How ridiculous can this get? How many tours in Iraq did you do? never mind I know not one. I would be willing to bet you never served a day. This rag head has an education and believes in the stone age. Good grief Freedom Rocked1776-2008, you sound like another weak minded Tea Partier by taking up for these clowns. Are you one by some chance? You weren't even there with these guys so how would you know what actually happened ? What gives you the right to judge these guys who you don't even know, and you weren't even there with them ? You always look like an idiot writing all of those fu*ked up comments on here all of the time. To Myself This guy doesnt care what you write about, He got what he wanted a reaction and nothing more. I guess its a hobby for him. He use to be really good at it but its getting old now and he cant hide what he really is. Please Myself, can you kindly refrain from using that filthy Tea Party lingo? It has no place here as I already said so many times before. People post things that I strongly disagree with but I just post my rebuttal here. The English language is extensive enough so no one needs to use that kind of lingo in order to make a point here! To Myself... you are forgetting the video that wikyleaks posted, and now your government is trying to kill the messenger..